Kristi has been a PTA with ProActive since its opening in 2007. She received her Associate of Applied Science degree from Western Iowa Tech Community College. She is also a graduate of Unity Christian High School. Kristi lives in rural Orange City with her husband Chris and three children: Brooklyn, Peyton and Cade. She enjoys working with all ages and conditions from post operative to athletic injuries. 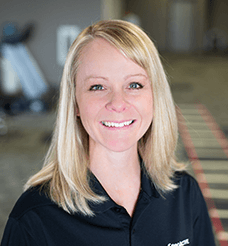 She values getting to know her patients and helping them achieve their goals so that they can return to work, play or any activity that they enjoy. She strives to create a fun, energetic and therapeutic experience and believes that a positive environment and attitude are big components in recovery. I love to work with my co workers using a team approach that allows our patients to get back to doing the things they know and love. I feel it is important to seek out individual needs and help achieve personal goals. Q: What is the one thing you’d like all patients to walk away with from their experience at ProActive Physical Therapy? It is my hope that we not only get results that allow them to live their best lifestyles now, but that we also educate them in ways to continue making improvements that will be beneficial to them lifelong. In my free time, I love watching my children in their activities, driving them to their various activities and just spending time as a family. I really enjoy being outdoors and spending time at the lake, on the beach or enjoying a campfire with friends.